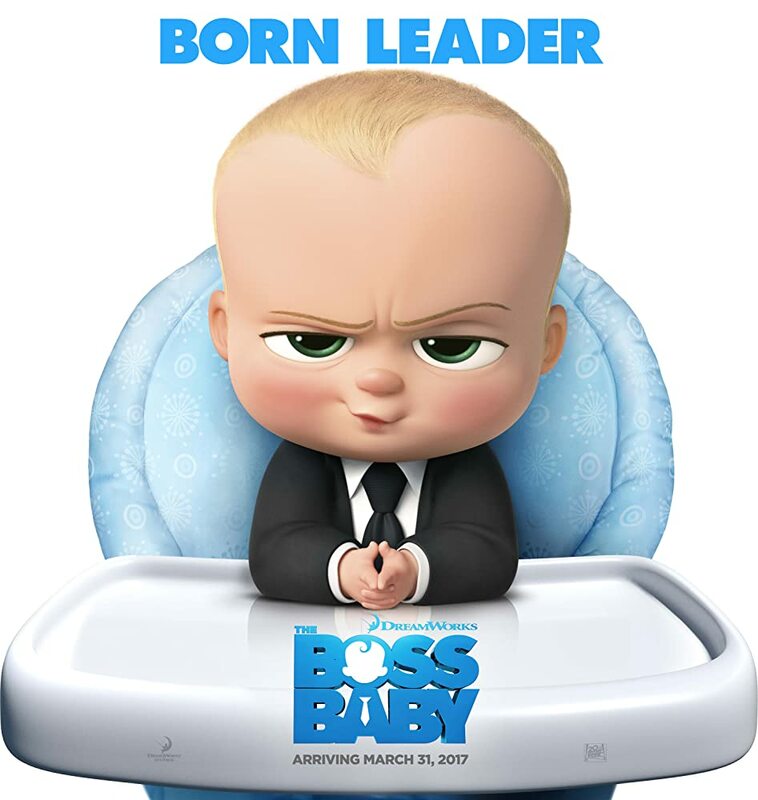 This one always makes me laugh because no one comes out of the womb speaking. In fact, for the first couple of years, our entire speech is "gaa gaa, goo goo". Now, granted, if you have a nice sounding voice, you might have an advantage in front of a group, or if you are stunningly good looking, you might command attention better. However, most great speakers become great at presenting because they really work at it. Here is the real secret that the academics, the toasting clubs, and the seminar leaders won't tell you. 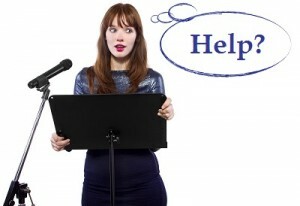 Public speaking is an EASY skill to master if you practice the right way. However, instead of doing things to decrease their nervousness, most new speakers work really hard to try to hide their nervousness. Motivational speaker Brian Tracy, wrote an article about what he learned from his speaking career. One of the major things that he learned as a professional speaker is that you have to train to be a speaker. His advice is to go out and give "300 presentations as hard and as fast as you can". I know what your thinking... 300? Man, that is a lot of speeches. Exactly! If you want to be a good presenter, you really have to practice. In fact, that is one of the main reasons that our presentation skills classes are so popular. Because our class sizes are so small, each participant gets to deliver at least eight presentations in just two days. This fast pace helps the presenter establish good habits and experience a series of successful speeches in a short period of time. By the way, if you are wondering where to find places that will allow you to speak, make sure and read the notes for Podcast #15: How to Find Venues to Practice Your Speech. 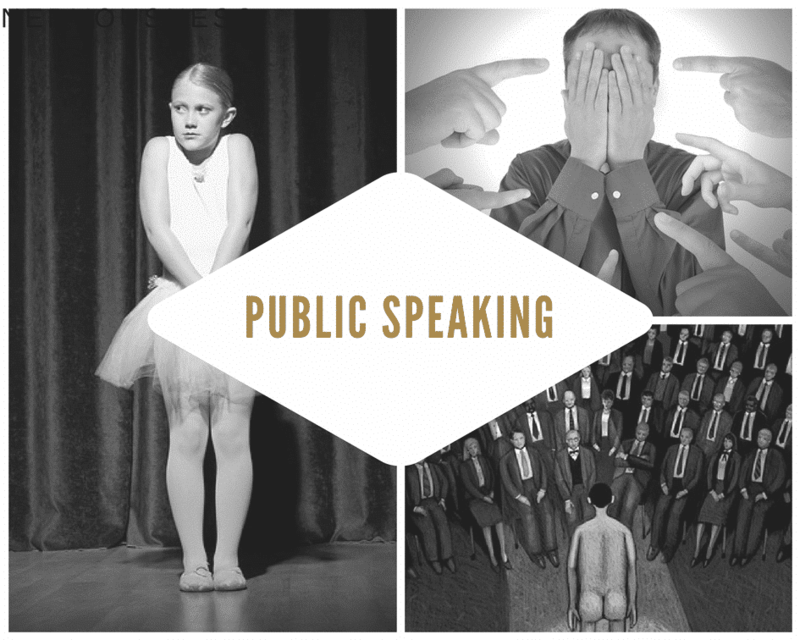 Surveys show that at least 90% of the population admits to feeling public speaking fear or stage fright. Surveys also show that over 45% of the population admit that the stage fright that they feel is so great that they avoid opportunities to present in front of groups. One of the first things that we share with people when we coach them as speakers, or when they come through one of our public speaking classes or presentation seminars, is that most of the stuff that happens to us when we get nervous is invisible to the audience. For example, just before we start to speak, most of us will start to feel our heart beating more quickly and forcefully. Some people will get sweaty palms or feel the butterflies in their stomach. We might feel light headed or even lose our train of thought. What do all of these things have in common? They are things that we FEEL, but are absolutely transparent to the audience. The problem that typically occurs, though, is that when we feel these symptoms of nervousness, we sometimes panic, and we might begin to feel even more nervous. What you want to remember is that other people who are presenting feel nervous too. You're not alone. 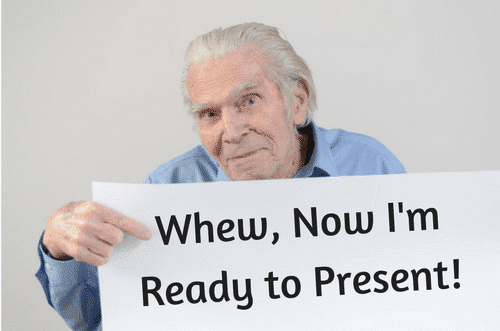 The good news is, that if you reduce your nervousness, you will have a distinct advantage over about 90% of presenters. I got nominated for a marketing award a few years ago. The organizer of the meeting thought that, since we were supposed to be the best marketers in the room, that the most fair way to choose the winner was to have each of us go on his stage and try to persuade the room to vote for us. When the organizer brought this up to me, I was honored. It also sounded like a lot of fun. So, I was really looking forward to the challenge. The day before the competition, I looked on the meeting agenda, and for the first time, I saw who the other speakers were. These were big-name guys who had been in the industry a long time. I started to get a little nervous. The moment arrived. I was the third of six presenters. Each of us were seated at the front table in the auditorium. The first and second presenters were people that I had never heard of, but they both got up and did excellent jobs. While the second speaker was presenting, I looked to my right to see what my other nominees thought about the first two speakers, and I was surprised because I was the only one still sitting at the table. I frantically began scanning the room, and in the dark area, way off to the right, next to the accordion wall, were the other three speakers. They were each pacing back and forth. These professional speakers were each trying to go through their presentations one last time. They were nervous, and they were looking for some way to release that pent up nervousness. All of the sudden, a calm came over me. I though, "Well, at least I'm not doing that." I knew that I was prepared, and that I didn't need to rush to the side of the room for last-minute cramming, because I wasn't really that nervous, I knew I could give the presentation in my sleep. My true confidence came back. By the way, my presentation was pretty good, and the audience loved me. I didn't win the competition, but looking at my competition, I'm okay with that. The big thing that I learned, though, was that even professional speakers who speak for a living get nervous. And when that nervousness hits them, the just prepare more. You can too. Ever since that first oral report or book report that we each gave in high school, we've been told that constructive criticism or critiquing our speeches will improve the way the we speak in front of groups. It was reinforced in speech class, communications class, or whatever your High School or University called it. It was reinforced again when we went to that Toastmasters group and the grammarian and another speaker-in-training gave us constructive feedback. My wife likes to watch cooking shows. Personally, I'm not a big fan, but I often experience in passing as I'm doing something else around the house. One of the things that I've noticed is that, on these shows, there will often be three judges. If the dish that they are judging is good, two of the judges will give a compliment to the chef. However, no matter how good two of the judges think that the dish is, at least one of the judges will criticize the dish. (I guess that makes for great TV.) My point is that no matter how well something is done, if you ask someone to be a critic, he or she will find something wrong. The old adage is, "Nobody's perfect." Since we know this, we can always find something to criticize. And every time that we do, we will be harming the confidence of that person. I'd much rather see Gordon Ramsey watching the participant as he/she cooks. When he sees the person about to make a mistake, go over and offer a piece of advice that will keep the person from failing in the first place. That little bit of proactive coaching will be see by others (and the people in the audience) in a way to where if they are faced with a similar situation, the people watching and listening will now know how to handle it. That is the difference between being a coach and being a critic. Coaches help people succeed, while critics wait for the person to fail so that they can critique the person. Okay, this one is somewhat true, but in a lot of cases, watching yourself speak on video when you are nervous will just make you more nervous. However, watching your video with a coach who will help you see improvements along the way will improve your confidence exponentially. Most of us are very critical of ourselves, so we will nit-pick our presentation nine ways to Sunday if we review it alone. So get a good coach before you start trying to use video tape as a tool. Public Speaking skill is just like any other skill in that when you practice and have a success, you feel more confident about yourself and you get better next time. So the key to becoming a great speaker fast is to have a series of successes quickly. Toastmasters is a great organization, but a lucky speaker might get a chance to give five speeches in a month, and there is a good chance that not every one of those speeches are going to be winners. So, if the club is really big, a Toastmaster may not see a lot of growth in public speaking skills right away. When you go to a class at a University or Junior College, you might get to speak three times in a 12 week class, and after each speech, you'll get the dreaded constructive criticism. So that way will take a while as well. 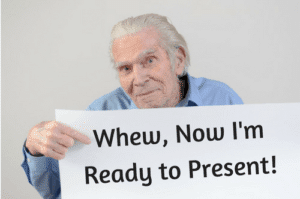 However, if you want gain presentation skills quickly, find a way to deliver four to six presentations with a really good coach in a short period of time. Ideally, if you can do it in a couple of days, you'll grow quickly. However, I've seen people have a lot of success by setting up a series of weekly speeches at the office or as a guest speaker at a Rotary Club or Chamber of Commerce meeting to get practice. The truth is that the time it will take you to become a great speaker depends entirely on how many times and how often you speak, and how many of these instances are successes. If you do Brian Tracy's 300 speeches in six months, you will definitely be more confident at the end of that time. If it takes you 20 years, you probably won't be. Again, though, that is one of the reasons why people come to a Fearless Presentations ® presentation skills class. Since participants can give so many speeches in such a compressed time period, it's literally like using a trampoline to dunk a basketball. Myth #1: Good Drivers have a Natural Talent. If we sent every 16 year-old kid out onto the freeway with no training. A few of them might do well, but most are going to have crashing failures. The few that do well will be seen as "Born Drivers," but the rest would be scared spitless of driving. Myth #2: I'm More Nervous than Everyone Else. If you're one of the 90% who had a failure on the freeway, but you still see a lot of people driving, you might believe you are the only one who is scared. Myth #3: Constructive Criticism is the Best Way to Improve. Again, you're still one of the 90% who just had the hair-raising experience on the freeway. Now you sit down in a classroom as one of your peers (or a teacher) rips apart your experience and tells you every little thing that you did wrong. Feeling better about the experience now? Myth #4: Video Tape Feedback for Driving is Valuable. Now you go back and watch the video of your fiery crash. I wouldn't blame you if you never drove again. Myth #5: It Takes Years to Become a Great Driver. If, after you had the above experience, you only attempted to drive once every three months or so for about two minutes at a time, guess what? It will take a LOOOOOONG time to get better. Sadly, you probably never will. Instead, get a good coach who you trust and conquer the fear now -- just like you did when you were 15 or 16 years-old and you took driver's education. Remember the techniques that we used back then? We got a little training and practiced with a coach right away, and we didn't move on until we had a success. Remember, you couldn't leave the school parking lot until you got really good at pulling in and out of a parking space.